There was an era in baseball when base stealers ruled the game. Vince Coleman and Rickey Henderson terrorized pitchers with hundreds of bases taken with their speed and guile instead of their bats. Managers attempted to stop the thievery with rocket-armed catchers and countless throws to first base. It helped. But the understanding of what contributes to a stolen base became more sophisticated over time. The time it took a catcher to throw to second base was only part of the equation. Pitchers played a large role. Their time to home plate was just as important as the catcher’s time to second. The slide-step was developed to drastically reduce that time. Pitchers were encouraged to vary their times to become less predictable. 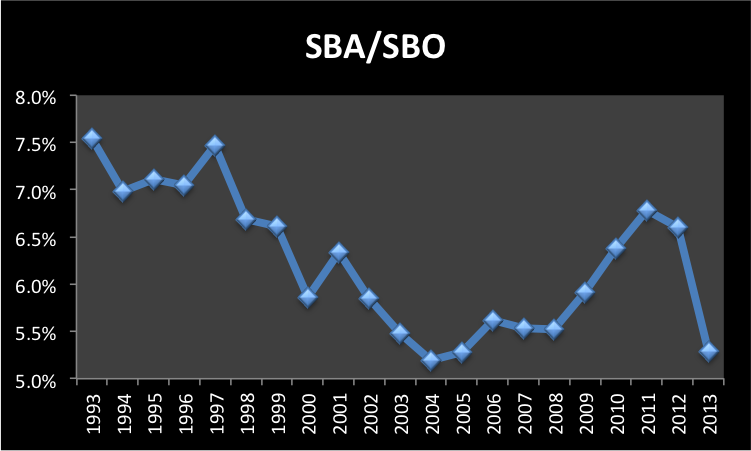 It led to a significant reduction in stolen base attempts and stolen base success over time. As the Seahawks come off a dismal seven-sack performance on offense, it is about time we become a little more sophisticated in our understanding of what factors contribute to a sack. The offensive line in the pass protection equation is akin to the rocket-armed catcher. Everyone knows the importance of a good offensive line when it comes to protecting the quarterback. It is easy to pin all the blame on the big fellas when you see a defensive player blow by them for a sack, and they have a key role. It just is not the complete picture. How long an offensive line has to protect the quarterback is arguably more important than the quality of the players on the line. Consider that in 110 times this season that Russell Wilson has dropped back to pass and got rid of the ball in 2.5 seconds or less, he has been sacked exactly one time (source: ProFootballFocus.com). In the 150 times he has taken 2.6 seconds or more, he has been sacked 26 times. His rating on those quicker throws is 108.3 versus 89.4 on the longer ones. Throwing in just 2.5 seconds may seem like a lofty goal, but five quarterbacks average less than that on all of their throws. Peyton Manning has made a career of releasing the ball quickly to avoid sacks, even behind very suspect offensive lines. He leads the NFL with a 2.36 average time to throw. Mathew Stafford, Andy Dalton and Philip Rivers all average 2.47 seconds or less, and all four of those teams rank in the top eight in opponent sack percentage (percent of pass attempts that result in a quarterback sack). Russell Wilson ranks 36th in the NFL in time to throw, averaging 3.18 seconds. Only Michael Vick and Terrelle Pryor take longer. He has improved slightly from his rookie year when he took 3.35 seconds to throw, and ranked 38th. Time to throw might be the most important factor to pass protection, but what contributes to that length of time? One obvious relationship is how far down-field a quarterback is throwing. The longer the throw, the longer the drop-back, the greater the time to throw. Seattle ranks fifth in the NFL in average yards per completion at 12.0 and eighth in yards per attempt at 7.5. The depth of throw is largely effected by scheme and quarterback decision-making within that scheme. Pete Carroll has made it clear that he wants to run to setup big play throws. Seattle should always be among the league leaders in yards per attempt and yards per completion if things are going right. Wilson, though, has shown a reluctance at times to take the quick throw either to an underneath route or to his backs in the flat. That is more him than scheme. Another contributing factor on time to throw is how well the receivers are winning on their routes and giving the quarterback a target to hit quickly. Slot receivers are often a solution when quick route wins are needed. Seattle happens to have the #1 slot receiver in the NFL in terms of yards per route run and catch rate (source: PFF). Yet, of the 23 slot receivers that have played at least 50% of their snaps in the slot, Baldwin has the fewest targets with only 30. Victor Cruz leads the slot receivers in targets with 74, but players like Davone Bess, Jason Avant, Mohamed Sanu, Jerricho Cotchery, Jeremy Kerley, and Brandon Gibson all have more targets than Baldwin. Not only can a quarterback not be sacked when the team runs the ball, but it creates opportunity for play-action passing to be more effective. Lineman and linebackers cannot be pure pass rushers if they have to honor the run. Wilson is #1 in the NFL in percentage of play-action passes per dropback. He has a 119.2 rating on those plays versus 86.1 on straight dropback passes. It will help to get Russell Okung and Breno Giacomini back. That is still weeks away, and is still very myopic in terms of diagnosing the problems causing the protection breakdowns. Wilson is quite possibly the most valuable player on the team and needs to be protected. This is a long-term issue that must be attacked in multiple ways. The coaching staff needs to return to its run commitment, regardless of how many players the defense stacks in the box. Pass attempts are up 5% and rushes are down 18% in the last four games compared to the first four. That cannot continue. Getting back to the run will expose Wilson less often to hits and improve the effectiveness of the play-action to deter pass rushers. There needs to be a greater mix of quick passes in the offense, and Wilson needs to be more willing to use them. Percy Harvin returns and is sure to be part of that solution. Baldwin should be as well. This will have the dual-effect of reducing the depth and time of Wilson’s dropback (3 steps verus 5 or 7), and his overall time to throw. Wilson may never be Manning when it comes to quick throws, but maybe he can get to the middle of the pack with his idol, Drew Brees at 2.7 seconds to throw, which is closer to league average. It is time for Seahawks fans and Seahawks coaches to take a more nuanced look at the pass protection problems. No area needs to improve more for this team the rest of the way.